EASIS Data Recovery is a high performance software wizard to reconstruct and recover data from a large variety of storage devices. Typically these are hard drives memory cardssd cards external storage devices and other media that are formatted with Windows (NTFSFAT) file systems. EASIS Data Recovery wizard makes the data recovery as easy as possible. 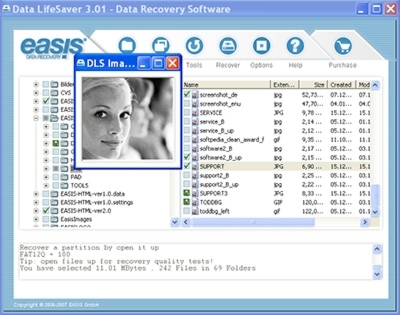 EASIS Data Recovery is a read only and includes free single file recovery. You only have to pick the hard drive or logical drive to be scanned. Upon completion you save the relevant data files and the recovery process is finished. Thats all. You only need very little knowledge on the problem or your computer system. The software analyzes it automatically und uses this information for the recovery process. The software works with the most sophisticated algorithms for pattern recognition. It will recover data that other data recovery programmes are not able to reconstruct. Test the software on your computer first. You will actually see the recoverable data in their original application. Otherwise you can recover single files for free to evaluate the software. EASIS Data Recovery is a read only software that will never destroy a storage device or any data saved to it. All recovered data will be saved to a media different from the original one.